To normalize the mineral metabolism in dogs, cats, guinea pigs, mice and fur-bearing animals. The introduction of additives in diets improves the coat, keeping good shape. As active substances it contains: protein – not less than 7.7%, fat – not less than 1.5%, fiber – not less than 7.9%, ash components – not less than 22%, calcium – no less than 1.7%, phosphorus – no less than 0.1%, sodium – not less than 2%, magnesium – not less than 0.8%, iron – not less than 1400 mg / kg, copper – not less than 2.1 mg / kg, iodine – not less than 1045 mg / kg, zinc – not less than 10 mg / kg , Manganese – not less than 21.5 mg / kg. The moisture content is no more than 12%. Does not contain genetically engineered products. To normalize the mineral metabolism in dogs, cats, guinea pigs, mice and fur-bearing animals. The introduction of additives in diets improves the coat, keeping good shape in dogs, cats, guinea pigs, mice, fur animals. – mink, fox – 1 teaspoonful for 2-4 weeks. 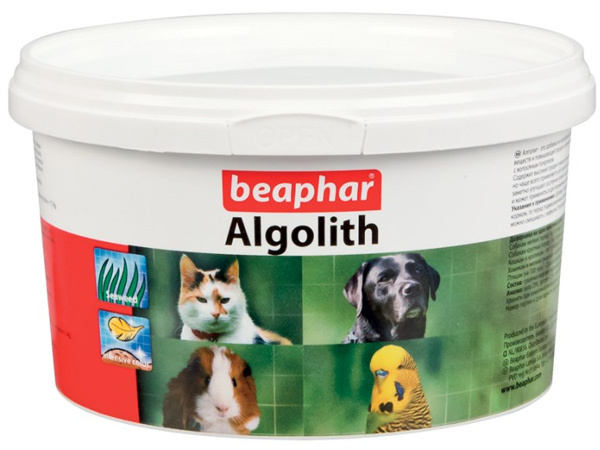 The additive is compatible with all the ingredients of feed, medicines and other feed additives. Packed in 200, 250, 500 g in polyethylene, glass and tin cans.